HUACAYA STUD MALE ALPACAS At Spring Farm. We have always strived to include the best genetics in our alpaca breeding program by utilising the very best stud male alpacas – in both huacaya and suri – available to us. To further enhance our breeding program, we have selected from amongst the worlds best genetics. In 2018, we have added two new grey stud male huacayas to our team: EP Cambridge Gunsmith (mid grey) and Full Metal Jacket (dark silver grey). Gunsmith will need no introduction if you were at the BAS National 2018. He had one cria at the Show - Velvet Hall Storm Surge. Storm Surge won the grey championship and was the only junior in the line up for Supreme! We bought Full Metal Jacket from Herts Alpacas in 2017 and he will be available for 2018 matings (now proven and we are expecting his first cria this year). 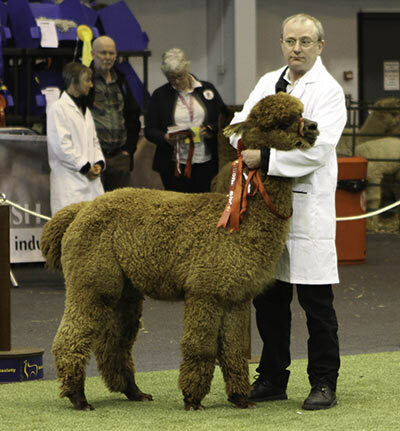 In 2017, alongside Full Metal Jacket, we also purchased an exciting black huacaya male from Herts Alpacas called Phoenix. At the 2018 South of England Show Phoenix took Reserve Champion Black male as an intermediate. He was shorn in June and we were stunned by the quality of his fleece - super fine and bright! To test this out, we entered his fleece (now as an adult) in the Heart of England 2018 fleece show. He took 1st place adult black Huacaya and then went on to take Reserve Champion Black Fleece! He worked for the first time in 2018 and we can't wait to see what his first crias are like. If you are as interested as we are – contact us for details. 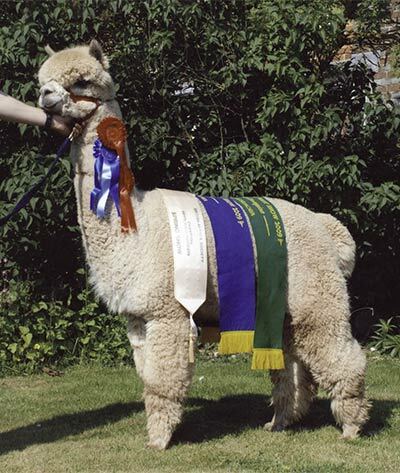 Eringa Park The Commandante of Accoyo is a multiple Champion winning mid fawn male sired by Jolimont Commisario and joined us from Appledene Alpacas of Kent where he was their outstanding stud male for a number of years! Shogun (mid fawn) joined us from Fowberry Alpacas bearing genetics from Fowberry Nobility and Top Account. He joined our stud team in 2014 and is now available for outside matings – contact us for details. 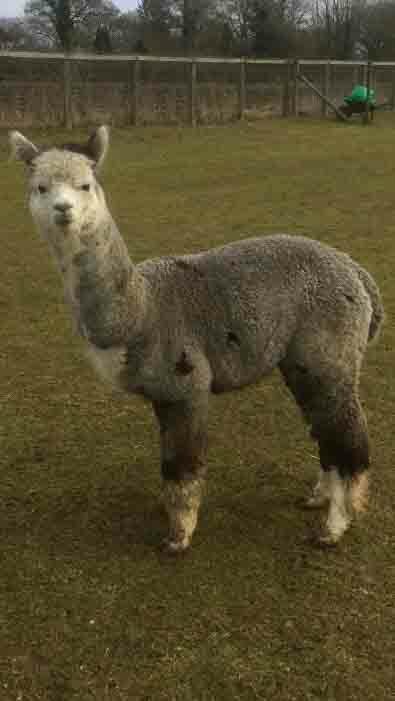 Bozedown Elector is a mid grey stud male with a proven history of producing Championship winning grey cria. 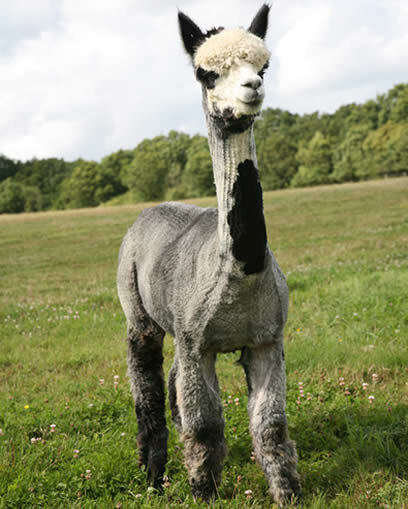 EPC Gunsmith, recently purchased by Spring Farm Alpacas was originally selected and imported as the first grey stud male ever owned by Beck Brow Alpacas. This followed his success at the Australian National Show 2014. Gunsmith is sired by the noted Wyterrica Propaganda who is in turn sired by the famous Blue Grass Waterloo Sunset. Gunsmith has a mid steel grey fleece which displays good density, character and style, and a very good degree of fineness and uniformity of micron. Gunsmith first progeny were born in 2016 and Beck Brow Alpacas and their co-owners Velvet Hall Alpacas were delighted with their quality. Champion Grey Male (Velvet Hall Storm Surge) at the BAS NATIONAL 2018 and was the only junior in the line up for Supreme! At the BAS National 2019, Gunsmith's crias again were dominant in the grey classes. Talla took Reserve Champion Grey Female and Storm Surge took Champion Grey Male for the second year running! At the NWAG 2019 the same two Gunsmith cria took Champion Grey Female and Champion Grey Male. We are expecting a number of Gunsmith's cria in 2019 - and needless to say can't wait. If you are interested in grey genetics - contact us for details as early as possible. Commandante is a solid mid fawn stud male who exhibits superfine, uniform and soft handling fibre characteristics which he reliably passes on to his crias. His tremendously bright fleece is dense, consistent and well organised in its style of crimp right to his extremities. He is a beautiful true to type macho, has a great phenotype and solid bone structure, together with a very easy temperament to manage. He is a recent and highly prized addition to our huacaya stud males, and it was the consistently repeated superior fibre characteristics in his progeny’s fleeces which made him a “must have”. His progeny exhibit consistently fine, extremely bright and dense fleeces on a good frame. Like all our stud males, he has an excellent jaw structure and bite. We are very pleased to have purchased Shogun from Fowberry Alpacas in North Yorkshire. Shogun is a solid light brown Nobility (solid dark fawn) son from a top performing Fowberry female line. His dam, Fowberry Nell (by WD Miguel) is medium grey and has already produced a stunning medium grey herd sire in Richebourg. Shogun’s sire is Fowberry Nobility, a Top Account son. Nobility is unbeaten in fawn male classes in the UK! Shogun is following in his father’s footsteps and was awarded Reserve Champion Brown male at the BAS National Show 2014 and Champion Brown male at the NWAG Championships 2014. Whilst easy to handle, he believes himself born to breed! Elector is a recent addition to our stud team, but one we are proud to include. He has an extremely fine and soft handling fleece.Bozedown “The Chief” is his sire and he has a grey dam who maintains a fine and soft handling fleece (2002 born).As a junior, Elector won his class (Grey/Roan huacaya Junior) at the BAS National in 2007. As an adult, he won his class at the Futurity 2009. He is a beautifully proportioned male in every respect with grey on both sides of his pedigree. 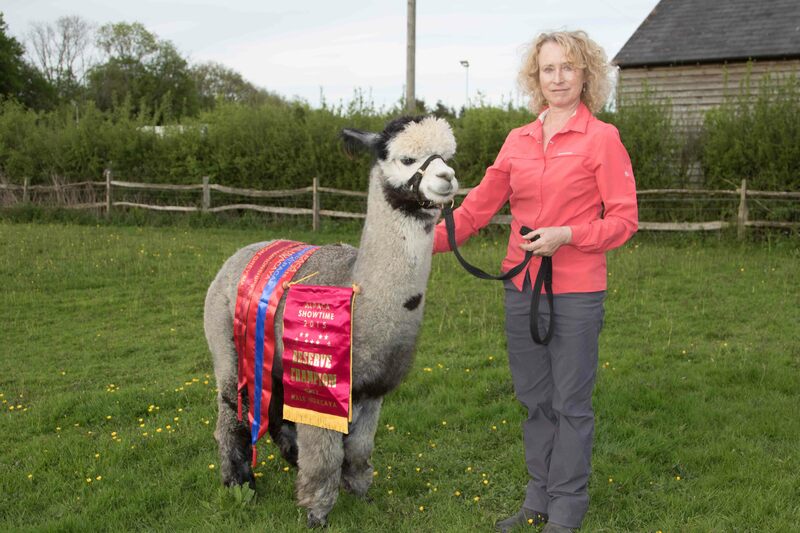 He has produced many stunning, Championship winning cria already including Springfarm Ketchup (standing at Stud at Atkins Alpacas), Springfarm Leo (standing at stud at Precious Gem Alpacas). We added Phoenix to our stud male Huacaya team in 2017 as a junior having seen him at the BAS National 2017. Phoenix's sire is Herts Nigel (solid mid brown) who has been shown all the way from junior in 2011 (1st at the BAS National), intermediate in 2012 (Champion Brown male at the Futurity and the South of England), adult in 2013 (Champion Brown male at the South of England) to senior in 2015 (1st at the BAS National and Fiesta). Phoenix is solid true black with immaculate conformation and bite, good fleece length and density with a fleece that displays good brightness and character from skin to tip. We took Phoenix to the South of England Show 2018 where he delighted us by taking Reserve Champion Black Huacaya. We sheared him in June 2018 and showed his (now adult) fleece at the Heart of England 2018 Fleece Show. 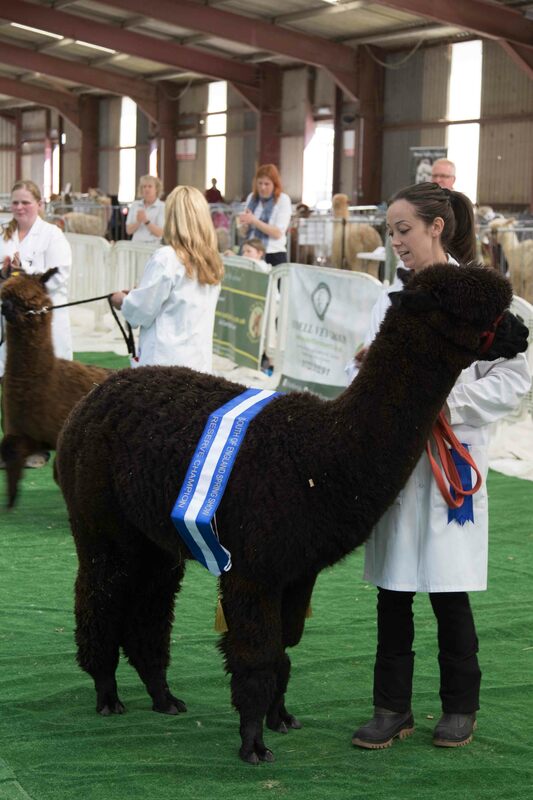 He took 1st place adult black Huacaya and then went on to take Reserve Champion Black Huacaya Fleece! Phoenix worked for the first time in 2018 - we are really excited for 2019 to see his first crias. if you are interested in using him, please get in touch. We added Full Metal Jacket (FMJ) to our huacaya stud male team in 2017. He is a stunning grey boy with excellent conformation, good bone, good bite and as with all Long John progeny NO blue in the eyes. He is out of Cedar House Long John and Herts alpacas best black female Indigo Usha of ACC. She has good black lines, amazing coverage and also has had two grey cria previously. FMJ has been shown twice - getting 4th at the BAS National in a very strong grey junior class and then got first intermediate male at the HoE Show. FMJ is a classical grey with a silver grey fleece, his fleece is of mid density and has a good handle, he shows good uniformity of colour through the blanket which has good definition for a grey. FMJ is not a typical grey in that he has a rose grey (brown) leg. What really attracted him to us was the softness of his fleece and the uniformity of micron at shoulder, midside and rump. We are expecting his first cria in 2018. Discounts apply on multiple stud fees. The first stud fee is at cost. The second fee attracts a 10% discount. 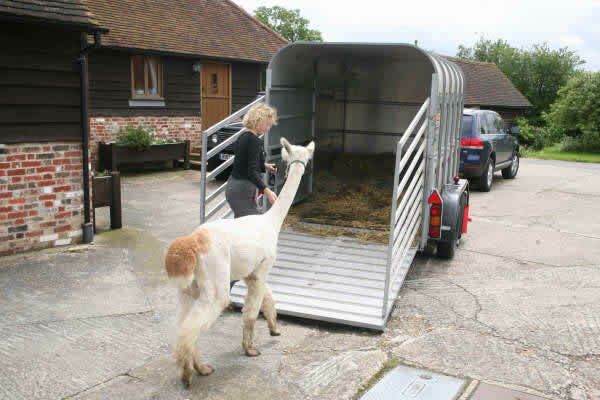 Owners of female alpacas can have their newborn crias and mothers on their own farm while the females are remated – by choosing our mobile stud services. 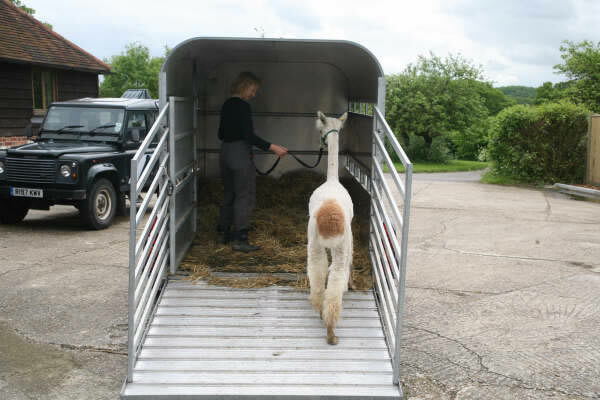 Alpacas load easily once halter trained (into a trailer or purpose built van in our case!) and sit (cush) when travelling, making the process of getting your females remated relatively stress free. All of our stud males are halter trained and used to travelling. Typically the male would need to visit approximately every two weeks – until the female is rejecting (spitting off). In our experience, the first mating is normally 70% successful. We should point out that the loading pictures are of Charlie Brown who is not a stud male but had hoped to be! We now have a purpose built van with all creature comforts for travelling our stud male alpacas. All females must be in good health prior to a mobile mating – and should not be offered for mating if in any doubt. We will discuss bio-security prior to a mobile mating taking place. The first visit with our males is free for a 50 mile distance from Spring Farm. For greater distances or return matings, a fee for mileage will be charges (currently £0.45 per mile). We will raise an invoice upon a scanned confirmed pregnancy. This scanning service is free – subject to being within 50 mile distance of Spring farm – otherwise a mileage fee will apply. Payment terms are strictly within 30 days.